The series from the Willis/Ross partnership on Internet safety, of which this is the third, gets better and better. The rhyming cautionary tale written from an understanding of the allure of social media to children is akin to a 21st century Belloc in its punch and panache. 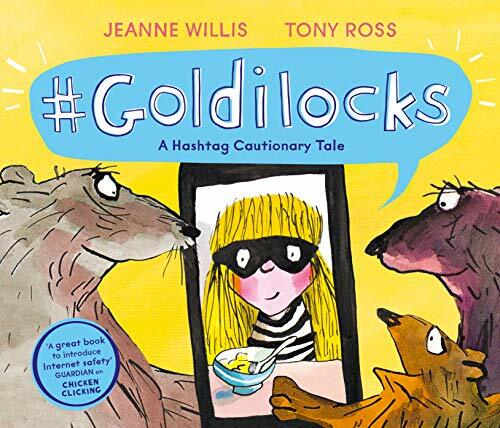 Goldilocks, like many youngsters nowadays has a mobile and uses it to share photos and videos on social media. Initially she sticks to relatively mundane things but in her desire to get more appreciation and additional followers, she starts posting photos of her family and all kinds of crazy things. At first to her delight, they get the desired effect but it’s not long before she needs to push the boundaries; only something really daring will do. It’s time to pay a visit to a cottage in the woods and there Goldilocks takes a selfie as she breaks in. Not content with that, she continues posting her actions concerning the porridge #pipinghot; a broken little chair #fun and then heads off upstairs where after a spot of bed bouncing it’s a case of #sleep. Back come the three bears who call the police and there’s no escape from the law. Goldilocks’ phone is confiscated and she receives a spell of community service at the residence she’d so thoughtlessly trashed. Even then there’s no getting away from what she’s done: those posts remain for everyone to see. Let’s hope the now friendless miss has learned that in future she must stop and think before she presses that send button. Hilarious as it might be, this story delivers a vital message through its combination of Jeanne Willis faultless rhyme and Tony Ross’s inimitable illustrations.